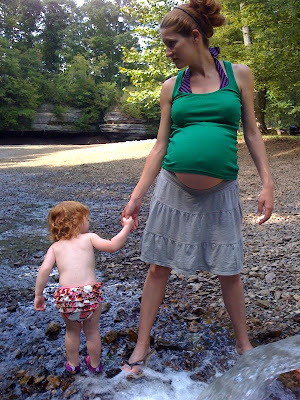 We were out at The Farm in Summertown, Tennessee awaiting the arrival of our second baby girl August 2011. Our first was also born at The Farm but sharing the live streaming video wasn’t an option at that time. Her birth video is posted here on the blog from back in 2009, it just wasn’t the labor, start to finish in real time. I was inspired to live stream this experience due to growing interest in the homebirth, natural childbirth and The Farm midwives experience. It was not only educational but also a great way for all the far away friends and family to be included in the experience. Almost 2000 people followed the labor and birth live August 29th-30th 2011, many people wanted to but missed out on the end for various reasons (personal and technical). The huge interest in the event also broke my site the night of the birth! Due to technical issues the end of the live stream footage was not saved properly but we had a back up camcorder going for our own home video library. Now that we’ve joined the back up video with the first part of the recorded live stream footage there is a full video to share but it is super huge! I’ve now replaced the old video that was posted here with the new complete one in 3 parts. This way you can choose which part you’d like to see. Enjoy. Note: Webcam has a full view of the bedroom and you’ll see the video here on this page (scroll down). It does involve nakedness and will be graphic, it is childbirth you know. View at your own risk. The recorded video below starts out when I am at 8 cm dilated and things are really kicking in to gear. Amniotic fluids are still intact. To join the conversation on twitter & share your own comments use this handy link to automatically add my username (@TalinaN and the #twitterbirth hashtag to your message.Watch the black scrolling search box next to the video there in the sidebar to follow our progress in real-time and hear what others are saying. We have confirmation on a very slow amniotic fluid leak, slowly but surely things are getting underway. I am staying unplugged and mostly offline as to not disrupt the groove. Reach Nathan if need be 🙂 When more action starts we’ll begin the live stream and notify accordingly. I’ve not had any internal exams done today but I did wake from a full night’s sleep to only be awake for an hour or so before feeling as if I could not keep my eyes open any longer. Slept all night and all morning basically and am now ravenously eating everything in sight. Then I’ll probably sleep more? I was 1 cm dilated and about 80% effaced this morning and baby is in an ROA position again which is better than being sunny-side up or posterior. Today is my “due date” according to the OBGYN’s ultrasound guestimations. Counting back from my LMP and using our fertility awareness charting our “due date” is the 26th so it is anyone’s guess when baby will come. We aren’t in a rush to induce labor or rush things though I am quite done with being pregnant and very discouraged to have not made any “progress” in dilating or getting closer to delivering this baby.